As soon as the rebar and the forms are ready, most building permits will require official approval before concrete can be placed. A code compliance inspector is then scheduled by the builder to visit the site, check the forms and rebar against the permit drawings, and authorize concrete placement with a stamp or signature. Unless the foundation is unusually complicated, most inspectors will only take a cursory look at the formwork, spot check some rebar, and sign off without comment, after all most foundations are pretty much the same. But problems occur if the rebar is dirty, rusty, or oily, or the formwork somehow affects public property. Rarely is the inspector concerned about the foundation’s design or engineering, that’s a given. 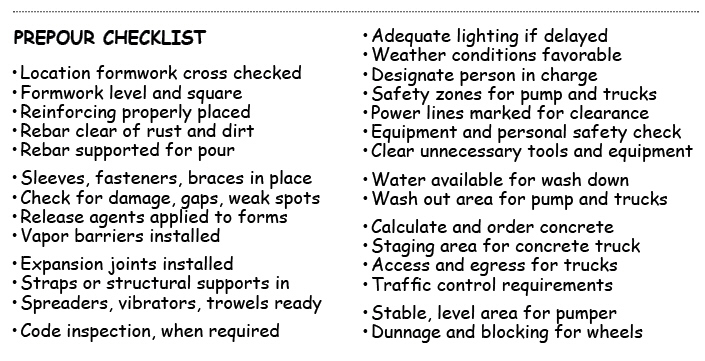 Good builders use a checklist to make sure the foundation is ready for inspection and anticipate any possible delay. Concerns include a final check of the formwork for gaps, weaknesses, or missing hardware, cleaning the forms and reinforcing, checking the position of sleeves and brackets, and making sure required insulation, expansion joints, and vapor barriers are installed. Prior to ordering concrete, it’s important to make sure all the necessary tools and equipment are on site and ready to use. This includes shovels, water, vibrators, spreaders and trowels. High density lighting might also be required on short winter days, especially if there’s any possibility of a delay. In addition, a safety officer should be assigned to check the weather, designate safe zones, truck routing and staging, mark power lines, check all equipment, and secure the wash down area. The entire site is then cleared of unnecessary tools, trash, and personnel. 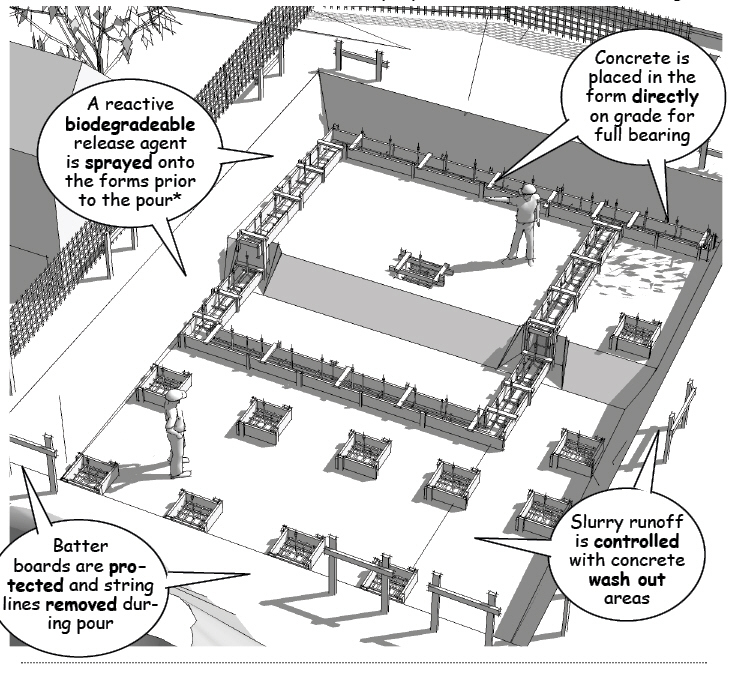 Once the concrete has been scheduled, a biodegradable release agent is applied to the forms to prevent bonding. 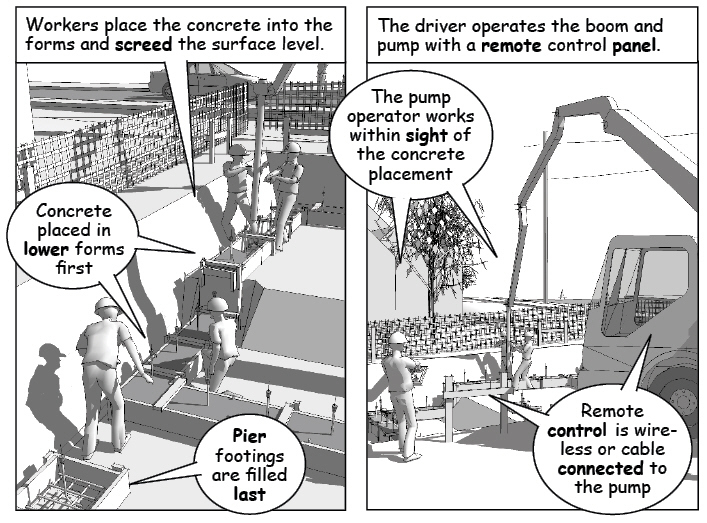 A concrete pump makes it much easier to move concrete around the site, reducing risk and the number of laborers required for the work, as well as making it easier to spread and vibrate the material once in place. 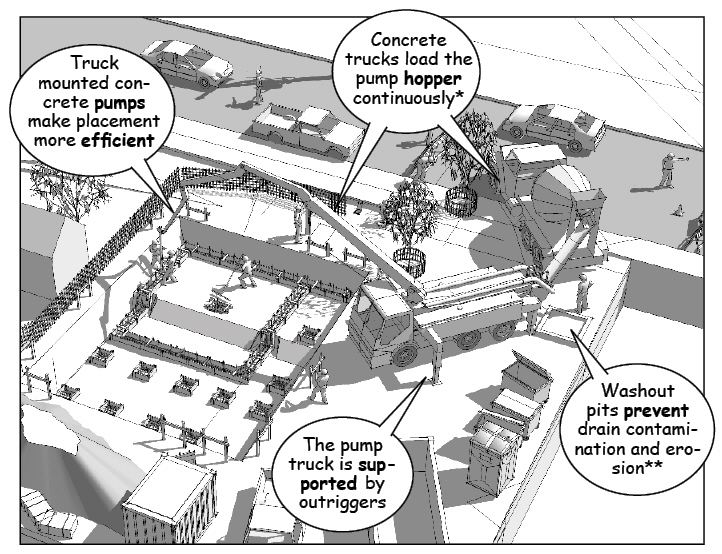 The number of concrete trucks depends on the volume of material required, the supplier, and jobsite conditions. For large projects, more than one truck will mean staging the work according to volume calculations and site conditions in order to control joints, minimize waste, and prevent potential contamination from excess concrete runoff.